Contemporary blues artists mostly tend to fall into one of two categories. There are those who are strictly bound by tradition, following either the Delta or Chicago school of thought, with their individual and inevitable limitations. Then there are those who genuflect at the altar of Stevie Ray, guitar heroes and wannabes channeling the spirit of Jimi through endless blooze-rock exercises. Otis Taylor, on the other hand, falls into neither category. A unique and exciting artist following his own muse, Taylor infuses his music with life and energy, odd instrumentation and rhythmic meter supporting his intelligent lyrics. 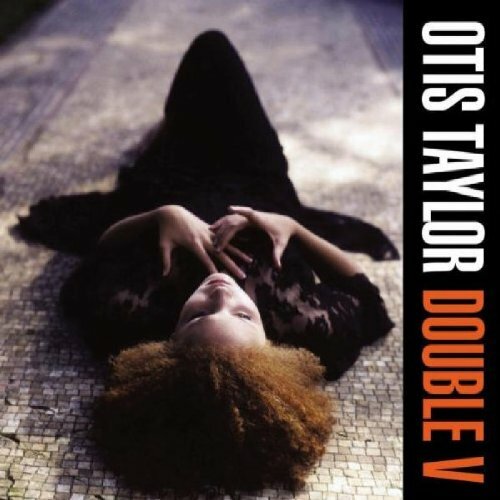 Otis Taylor sounds like no bluesman you’ve ever heard before. Perhaps it’s because Taylor spent almost 20 years outside of the music industry, or maybe it’s because his musical education includes liberal doses of both rock 'n' roll (he played with Tommy Bolin back in the day) and folk (courtesy of the Denver Folklore Center). His songs blend elements of blues, traditional folk, and rock music with erudite lyrics that often offer edgy social commentary or historical morality tales recreated for a modern audience. The resulting mix is invigorating, Taylor’s imaginative and sometimes-reckless instrumentation satisfying your soul while his brilliant, thought-provoking wordplay massages your brain. Double V is Taylor’s second album for indie blues/jazz specialists Telarc and his sixth effort since ending his self-imposed exile from music. The album is not entirely unlike previous award-winning efforts such as White African or Respect The Dead, although it is a bit more ambitious. With Double V, Taylor forsakes the potent band that he’s used since returning to music. Using sparse instrumentation on Double V to highlight each song’s vocals and lyrics, Taylor’s mix of guitar, banjo, and mandolin is supported by his daughter Cassie’s steady bass rhythm and augmented by the odd horn or cello. Each song on Double V is thus provided its own canvas, at times stark and at other times quite beautiful. It’s his songwriting on which Taylor has built his well-deserved reputation, and Double V meet the high standard set by his earlier work. “Please Come Home Before It Rains” offers an upbeat soundtrack as a sailor reads a letter from his wife and reminisces of the things that he’s seen and the family that he misses. “Mama’s Selling Heroin” is semi-autobiographical, dark instrumentation and haunting vocals underlining the story of Taylor’s mother, serving as an allegory for the pain and heartbreak that drugs have brought to the African-American community. Lest you think that Double V is overly dour and depressing, Taylor ends the album with the uplifting “Buy Myself Some Freedom.” Sung in an ethereal whisper by daughter Cassie, this tale of a young girl searching for a better life is filled with hope and dignity. It’s a fitting end to a solid collection of songs that present reality as a minefield of tragedy, emotion and triumph over adversity.